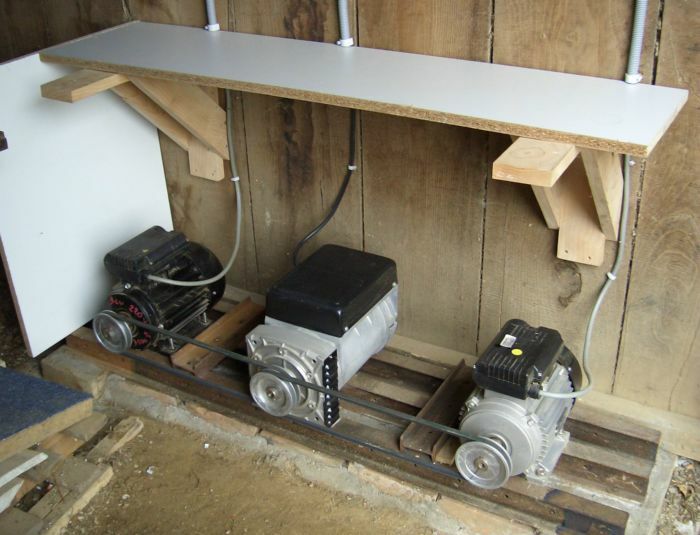 Home-built 3 phase Alternator and some renovated machines. 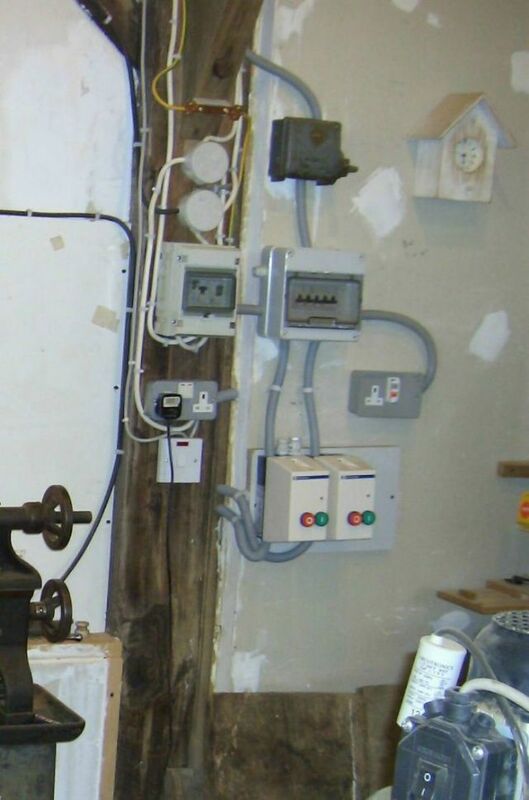 6kva 400v 3-phase self-regulating alternator. 2 tandem 3hp motors 4" vee-pulleys- guards being built.. Wired Wye, neutral center to ground, Due to motor slip, I'm getting c. 390v at c 48hz. 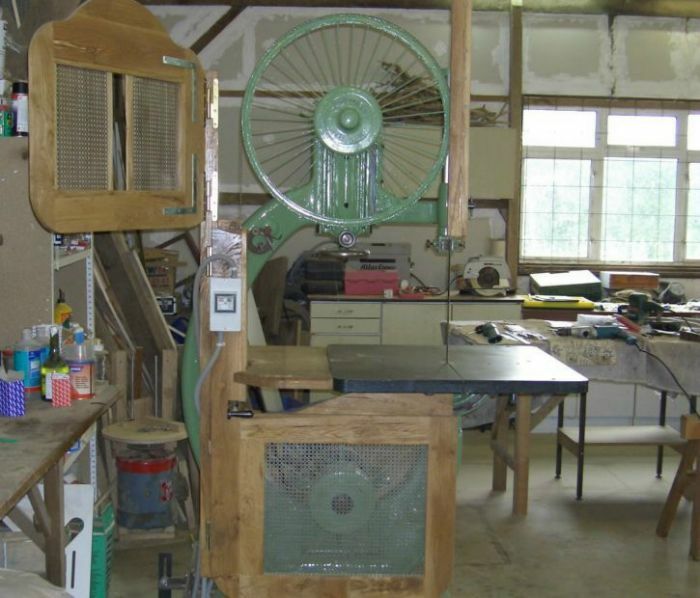 Renovated "Copeau" bandsaw, c.1930. All original parts including motor. New carbide blade, 14 ½" depth of cut, 26 ½" throat.. Original 3" flat belt drive replaced with grafted on glass-fiber vee-pulley. Motor 5hp, 415v, 6 pole 970rpm rated, ventilated. 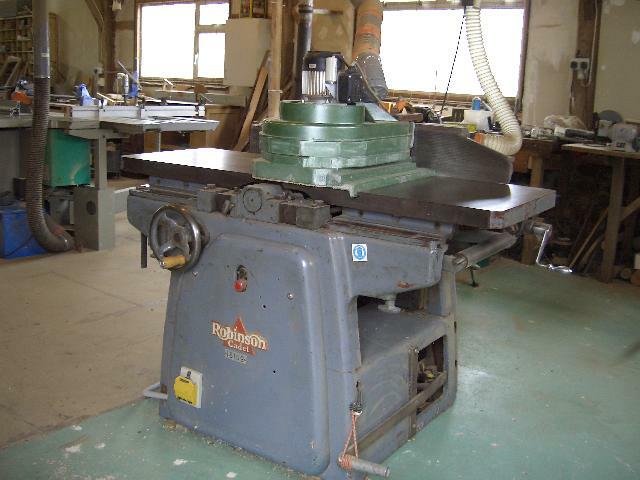 1959 Robinson jointer / thicknesser ( 20" x 9" ). 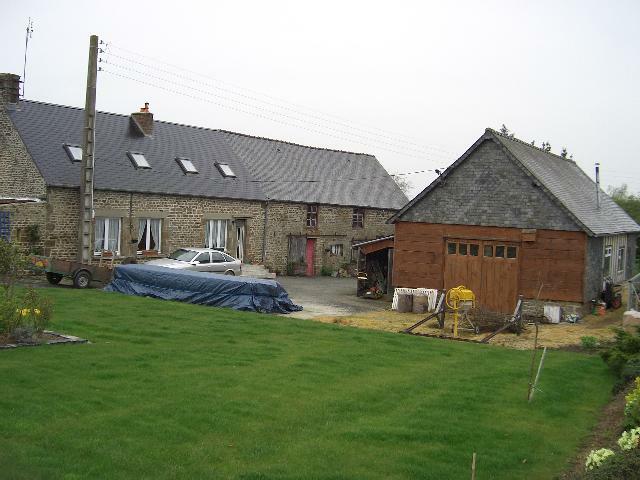 5hp 415v 3 phase 2 pole 3000 rpm. 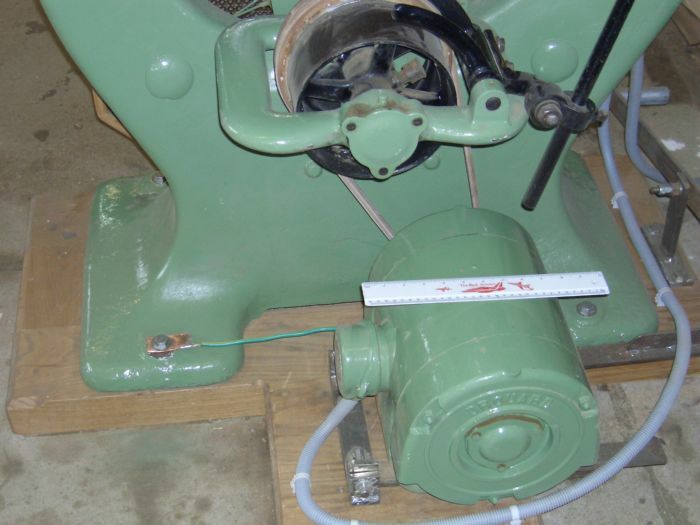 On the bed is a home made 'chip-smasher'- 240v ½ hp 1470 rpm to break up the long shavings of walnut or cherry, they clog up the extract pipe - shavings go through a 9" diameter centrifugal rotor, and emerge as sawdust. 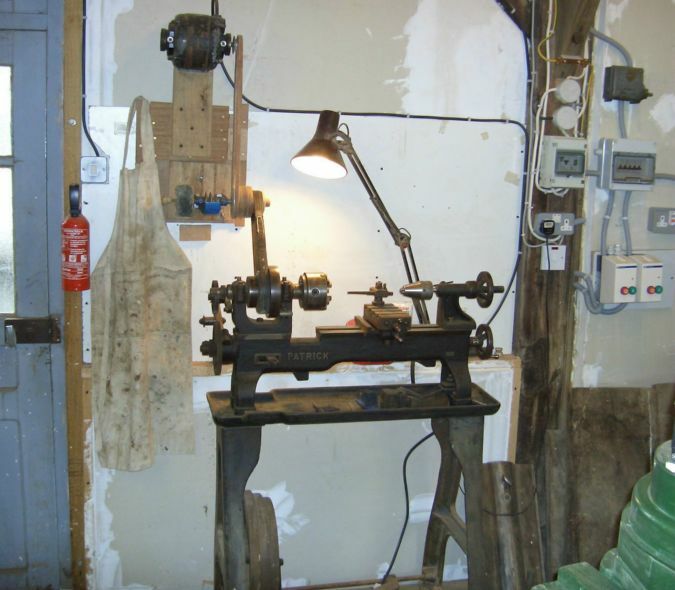 1930s foot-treadle operated machinist?s lathe found in England. Only tried pedalling it once, then I fitted a salvaged 240v ¼ hp 1450 rpm motor. Very useful 100+ year old Model 104 American speed indicator for motors/machines. "L S Starrett Athol Mass USA" Patented April 13 1897. Made before 1905 when another patent was taken. To use, point is applied to shaft centre and a stop-watch is run for 60 seconds, then read off the rpm. . Originally nickel plated, Starrett still make these. I love old stuff like that! You could turn the middle pulley down a little smaller on the metalworking lathe to overcome the underrun. Any ideas on how to get that kind of belt to stop vibrating? My dad's cast iron table saw came through the workshop fire intact, well the cast iron did, so I'm putting a new motor and pulleys on it. Trouble is the belt won't stop vibrating wildly. Any ideas? Use a new belt(s), make sure pulleys are in good order & run true on diameter and are in line; use a straight edge over the pulley faces. Get the correct tension. Find distance between pulley centres & divide by 64. So a 16" (400mm) centre distance would give 1/4"(6mm). At the right adjustment, you should be able to depress the belt at its center by that amount with a hard push with your thumb. DON'T pry the belt on with a screwdriver, you'll damage the cords, or worse damage the pulley rim, especially cast iron. Fit it loose and then adjust the motor (or w.h.y. device) to the correct tension. I used oak wedges and fitted bolts as it's a home-brew. Run the machine, and after say 24 use-hours, when bedding in will have occured, recheck/reset the tension. Make sure everything is tight- but not to the point of breaking the bolts! If the belt flanks or the pulley bottom(s) look very shiny- they're worn out. If it still vibrates- suspect fire-damage to layshaft or saw bearings. I had fantastic results on my table saw replacing the stock, cast-iron pulleys and belt with machined pulleys and a LinkBelt. (A LinkBelt is a strange-looking contraption consisting of red sections about an inch or so long, linked together.) There was significant vibration before the change; after the change, you can stand a nickel on its edge while the saw is running. I thought about that linked belt, it had good write ups and seemed the answer, as I have a lot of vee-belting. 'Fenner' sell this in the UK. It comes,I think, in 10 or 25 metres packs. Thanks a bunch for them pics (and to Paul for posting them). I could look at pictures like this for hours. Oddly enough I know for a fact that there is an RPM meter of the exact type that you posted above in the Electrical Store (read: museum) at Pareora Freezing Works, south of here, I've used it before. I may show my ignorance/lack of knowledge here, but why did you go for 2 motors driving the Alternator?. Oh and BTW Alan, good to see you've got a Fire Extinguisher there, essential equipment in any workshop worthy of the name. Trumpy, thanks for the comments. Those 'Starrett' speed meters appear on E-bay auctions regularly -mint 1905 onwards models seem to go for only US$10-20, and are a boon for analysing induction motor performance, (ie find slip,frequency). Hard to use at first, as you know, co-ordinating beween the stopwatch and engage/disengage, but I average over a few goes. Great setup and ingenious solution to the singe/3ph. conversion problem!! If I'm not mistaken, if you were to increase the motor pullys diameter a bit (or decrease the alternator's pully size) wouldn't that correct for the motor's slip and bring the output back up to spec? Staying within the RPM limit of the alternator of course.